This image realistically demonstrates the intensity of the reflected light in certain slot canyons across the Southwest. 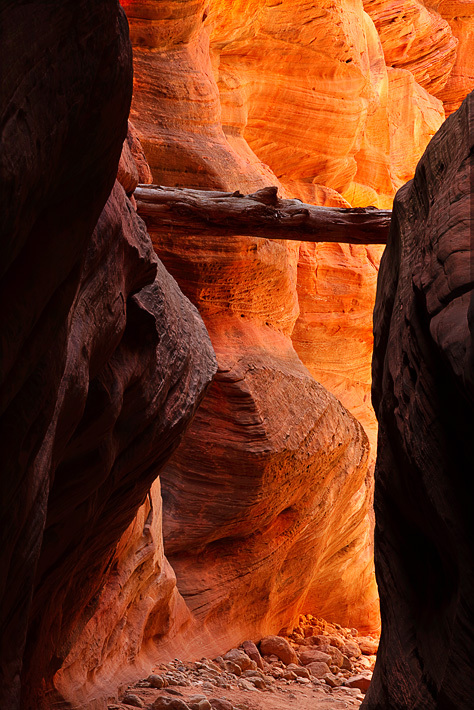 This sandstone photo was captured in Buckskin Gulch, one of the world's largest slot canyons at over 13 miles in length. I included the stone covered ground to provide necessary perspective for the height and size of the fallen and wedged tree. I estimate this tree was approximately 20 to 25 feet off the ground and water was responsible for it getting there! Pretty amazing when you think about it.... Photo © copyright by Michael Greene.